Washing your car by hand can be a tedious task, but did you know that it actually does more harm than good? Though you might save a couple of bucks, when you wash your car by hand, your vehicle isn’t the only thing getting all soaped up. Every chemical that you put into your bucket ends up running down the driveway into the storm drain and into Lake Erie. Just like when you pour water down the drain at home, at a professional car wash, all water from the cleaning process is captured and cleaned before entering back into the environment. When we wash cars in our driveways, we are washing away dirt, oil, and gasoline residue mixed with harmful chemicals and detergents. This harms aquatic life and contributes pollution to the very ecosystem we are trying to protect. Although Kwik may look like a cold war bunker from the outside; on the inside, our environmental footprint is actually quite small. In fact, Kwik Car Wash is one of a small percentage of professional car washes that meet the criteria required to earn the industry’s prestigious WaterSavers® certification; anaccolade for which we are very proud. Kwik is dedicated to continuously shrinking the size of our footprint and that includes water consumption. Did you know washing a car at home typically uses between 60 to 120 gallons of fresh water? We are now using less than 30; and we professionally dispose of all water and waste from the car cleaning process. That’s right, not one ounce of the grime that leaves your car ends up in Lake Erie. Our proprietary blend of the soaps and sealers that give your car the Kwik Car Wash shine people have come to love never hits the environment, and as long as you keep washing with us, it never will! And if you’re a member of an organization looking to raise money, check out Kwik’s fundraising program. 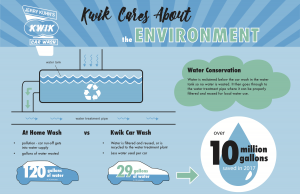 Compared to the hose and bucket parking lot car washes we’ve all come to know, Kwik’s program of partnering with your organization to sell our car wash passes and keep a part of the profit is a fast and easy way to support your program and the environment! Email Kwik Car Wash for more information. So next time you yearn for a car that shines inside and out, pay us a visit at the corner of W. 130th and Pearl — Mother Nature will thank you!